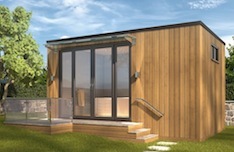 We manufacture our Home Office, Garden Rooms, and Garden Buildings as kits of pre-assembled components rather than the pile of wooden sticks some kit companies supply. So, all the wall panels are built and are ready for erection once your floor is assembled and levelled. Joists locate into predetermined positions saving assembly time, whilst removing the risk of errors due to incorrect measurement. Most of the cladding will fit straight into position having been pre-cut to length etc etc. Our objective is always to minimise time on-site (isn't it always cold, windy and raining....?) by doing as much work as possible in the controlled environment of our factory. It is a similar process to that adopted by some well known Scandinavian and German housebuilders such as Huf-Haus and Scandia-Hus who supply kits of parts for site assembly. Sounds simple - but of course there is a lot of skill required, primarily in ensuring that the base is level and dimensionally correct; all panels are assembled square and plumb; and cutting some of the cladding panels around window and door appertures is done with due care and attention. We always recommend you use our experienced Installations Team, for whom we provide a full 10 year insurance backed guarantee.